On the river, knowledge steers every decision. How to match a fly to the hatch, where to find the water moving a little slower and deeper, and a mastery of knot techniques. Next, adaptivity is required. For even with all that knowledge, unknowns will always rise faster than the fish. And then there is the careful coordination of moving parts. How to mend the line without taking eyes off the lie. When those qualities in fly fishing combine, something remarkable happens. 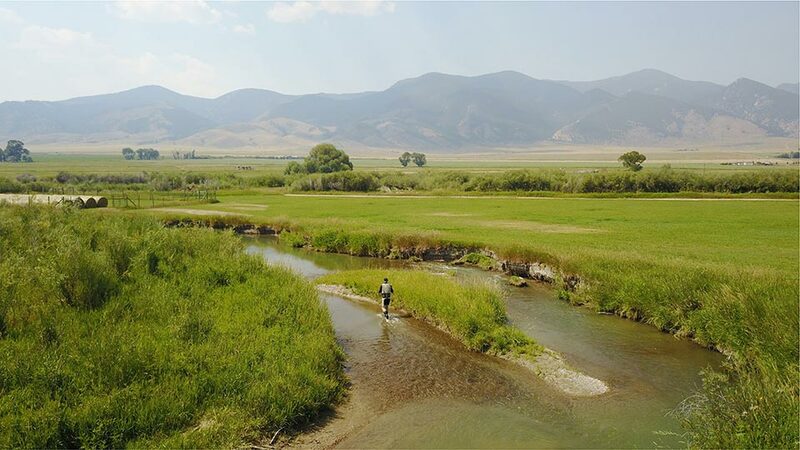 As A River Runs Through It author Norman Maclean best put it, between the forward cast and the back, “a world perfect, and apart” can be made amidst the majesty of Montana’s backdrop. Jody Marler launched Fishcamp Custom, determined to bring the qualities so innate to his passion for fishing—deep technical knowledge, an adaptive resourcefulness, and seamless coordination of moving parts—into the skill of homebuilding in southwest Montana. The work Fishcamp produces has, in turn, set them apart. When two such couples, who recently moved to the Paradise Valley, sought to build homes that would serve both their outdoor aspirations and personal aesthetics, Fishcamp Custom cast its talents at both projects to merge function and style in their Montana retreats. On 20 acres lined with black cottonwood and juniper, at the base of Dexter Peak, a couple from the Bay Area began building their Montana retirement home nine years ago. They started with the guest home and garage, and then spent time getting to know the property bordered by state land to the east, ensuring an unobstructed view of their slice of the Absaroka Range in perpetuity. When they decided it was time to build the main residence, they enlisted the help of Fishcamp Custom and revisited the original design by RG Architecture based out of northern California. Robert Gregory, the firm’s principal, interprets the design as “a module of heavy trusses, steel plates, and concrete floors, powerful enough to stand on its own as an object against the rugged aspects of the land. We tipped the roofs in a shed-like fashion, with dormers in the opposite direction to pick up light in all parts of the house.” When Fishcamp completed the second phase of the property, three well-proportioned forms emerged, all connected by covered breezeways to aid in the logistics of four-season Montana living. The arterial breezeway’s materials, locally-sourced Frontier Stone columns and red cedar siding, are continuous from indoor to outdoor spaces, yielding a sense of seamless connectivity to the land. Inside, the mountain view dominates the great room, which serves as an open-form dining and living space. A full sweep of windows frames the view from every area. With this huge expanse of windows and high ceilings, Fishcamp and RG were vigilant in sustaining a human dimension within what could be an otherwise overwhelmingly large space. To achieve this, Jody’s team constructed a low, steel-trimmed wall, which houses the fireplace and shelving, in tile that mimics the look of poured concrete. “The fireplace wall helps anchor the sitting area and provides a comfortable scale without blocking any of the view,” he explains. Ingo Maurer light fixtures further help to center each space. On the Yellowstone River bench outside Pray, Montana, the rolling grassland calls out for a ranch rustic home befitting the heritage of the valley. 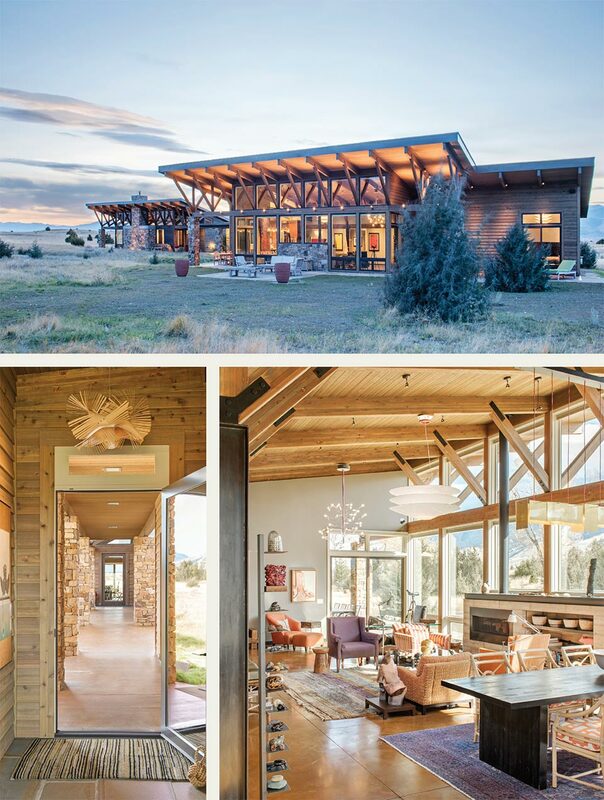 For this, a couple relocating from Nevada commissioned Fishcamp and one of their partners in design, Adams and Associates of Livingston, to conceptualize a home that references the history of the land and their sportsman lifestyle. Architect Carita Adams explains the interactions among the clients, architect, and builder. “We all bring different experiences, expertise, and creativity to the design process,” she says. This synergy manifests itself in a home that gives the impression of a property connected over time. A mix of exterior materials, including rough-hewn timbers, reclaimed lumber siding, and patina’d steel, break up the volumes. Red-trimmed windows and knee-bracing details visually connect the main home to the garage, where the charm of a classic barn structure is captured. Fishcamp’s ability to coordinate the talents of multiple craftsmen is on display in the great room, where custom cabinetry built in Fishcamp’s impressive in-house shop sits on either side of a stacked Montana Moss stone fireplace. The iron grate and mantel details were fashioned by Sore Elbow Forge out of Bozeman with stonework done by a local mason out of Livingston. Jody is purposeful in connecting and guiding the efforts of craftsmen early in the process, resulting in unified details that appear to come from the same hand. As the home was being framed, the clients requested the addition of steel accents. Jody and his full-time team of eight adapted the design to use custom steel trusses overhead, as well as steel railings on the stairs leading up to the loft that serves as a “his and hers” office overlooking the river. This same ingenuity was put into the master bathroom, where Jody used white-washed, reclaimed lumber to add interest and contrast to the luxe marble flooring and a chandelier centered over the bath. For the client’s growing wine collection, a humidity-controlled wine cellar sits on the lower level. Fishcamp’s custom woodworking skills are center stage in this space, where reclaimed fir cabinets trimmed with copper hold the client’s vintages. To amplify the wine country ambience, scrolled iron doors, a gift from the client’s mother, open into the space and detailed paint washing techniques add an aged hue to the walls and ceiling. The gear room, a bridge between the residence and barn structure, and home to a collection of shed antlers and well-used waders tucked into handsome cabinetry, is where it all begins for Jody. “If I could start the conversation with a client in any room, it would be the gear room. Not only should this space work properly, but it sets the tone for the home and for how the client will use it. 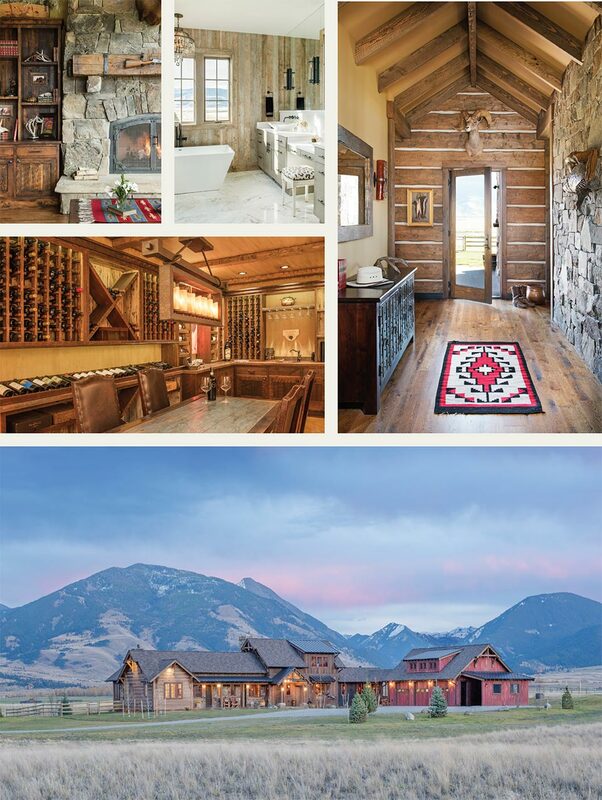 The gear room tells the story of why they want to live in Montana.” The why we live here is an everyday reminder for Jody and the Fishcamp team that, more than beautiful homes, they are collaborators in their clients’ aspirations. It’s a task they rise to each time. For more information call Fishcamp Custom 406.224.1222.